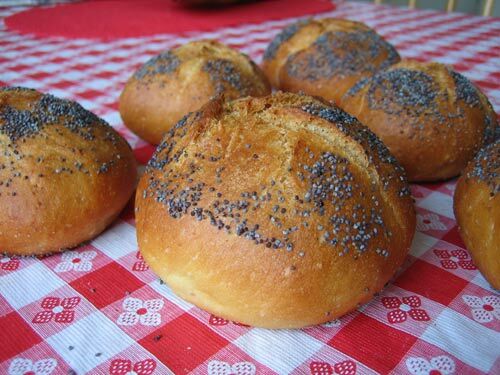 Kaiser rolls are great for picnics, sandwiches, and other summertime meals. The hardest part about making them is shaping them. If you want them to be perfect, order yourself a kaiser roll stamp. 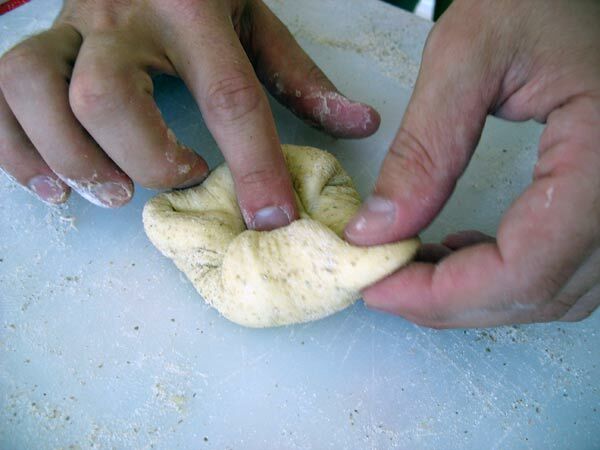 Or you can roll out the dough out and knot it the way Peter Reinhart suggests in The Bread Baker's Apprentice. Below I'll show you the technique I've found easiest. The recipe I'm using is a cross between Bernard Clayton's recipe and Peter Reinhart's recipe. Peter's recipe uses a pre-ferment, the one I've listed below does not. You can adjust this recipe to use a pre-ferment quite easily: simply throw in some old dough if you want to use a pate fermentee. Or pull out a cup of the flour and 1/2 a cup of the water and 1/4 teaspoon of the yeast, mix them together, and let them sit out in a covered bowl overnight to create a poolish. Either technique will result in a more flavorful roll, but if you are going to be making sandwiches slathered in mustard or a sharp cheese, something likely to overwhelm the flavor of the bread, the extra work is probably not warranted. Combine 3 cups of the flour and the other dry ingredients in a mixing bowl or the bowl of a stand mixer. Mix in the water, eggs, and shortening. Knead by hand for approximately 10 minutes or 5-7 minutes in a mixer, adding more flour by the handful as necessary. The dough should still be tacky but not terribly wet. 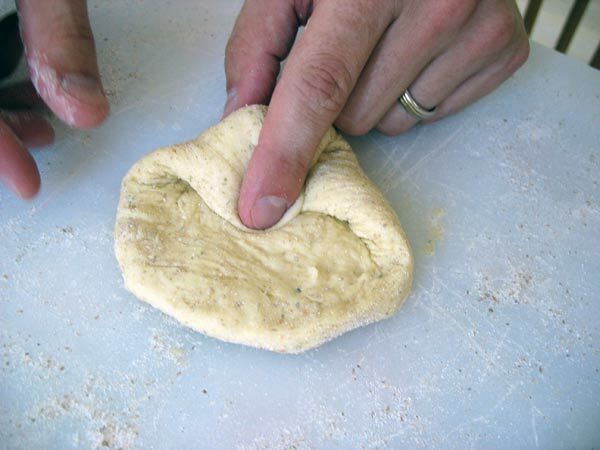 Place the dough in a greased bowl, cover, and allow to rise until doubled in size, approximately 1 hour. Allow it to rise a second time for an hour before shaping. 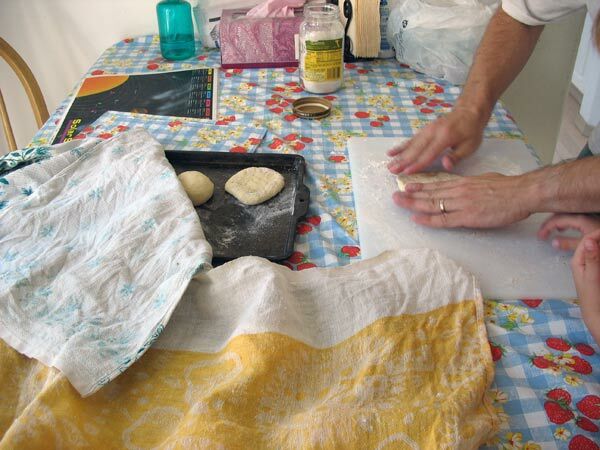 To shape the rolls, divide the dough into smaller pieces (if you are particular, use a scale to get them the same size). 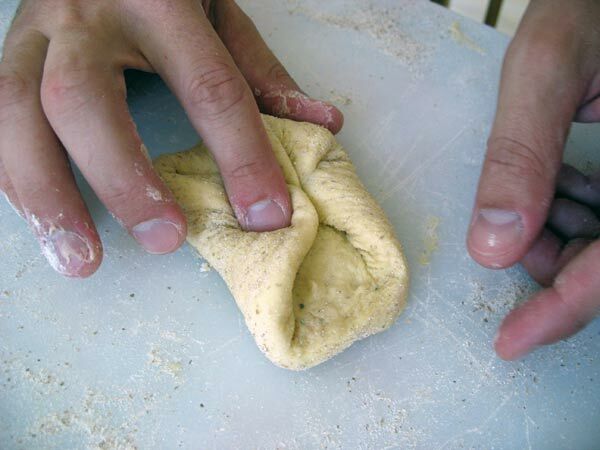 Roll the pieces of dough into balls and cover them with a damp kitchen towel so they can relax for 5 minutes. 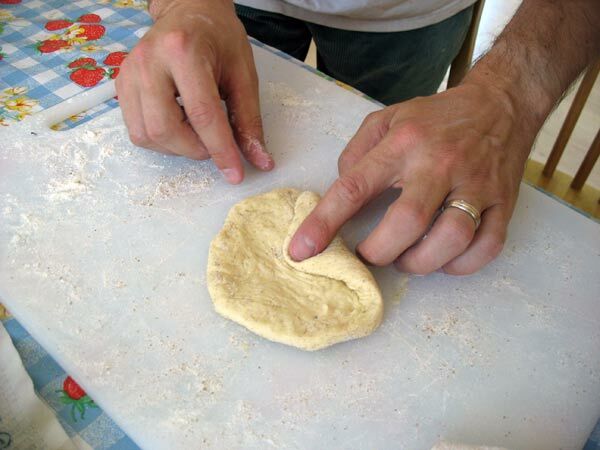 To shape them, first I press them out into flat disks on a well floured surface (Clayton suggests using rye flour, though any type of flour will do). I let them rest, covered, another 5 minutes. 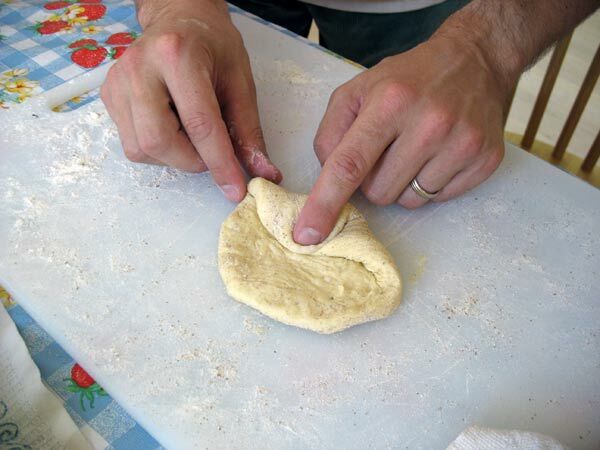 Then I stretch the dough a bit thinner again and fold pieces up into the center. Finally I press down in the center to seal it up tight. 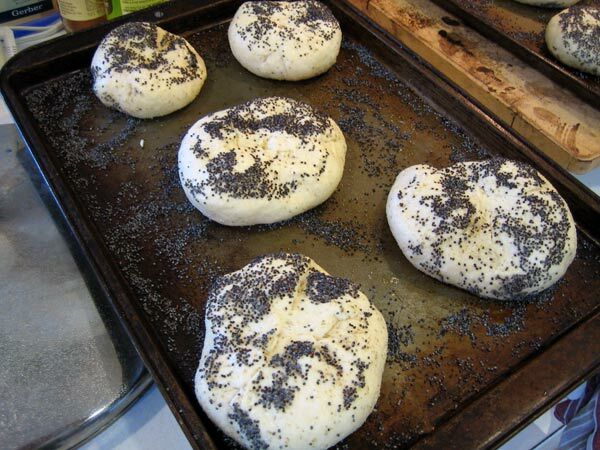 I place them face down on a sheet pan covered with poppy seeds while they are rising for the final hour. One could just as well let them rise face up and then spritz them with water and sprinkle the poppy seeds on, but doing it this way prevents the seals from splitting while they rise. Preheat the oven to 450 during the final rise. Just before placing them in the oven, flip the rolls upright. You want to have steam in the oven when you bake them, so use whatever technique you prefer: squirting them with water, squirting the oven sides with water, pouring boiling water in a preheated cast-iron pan or a cookie sheet. These rolls take around 20 to 25 minutes to bake. I suggest rotating the pan once 10 minutes into it so they'll brown evenly. Related Recipe: Potato Rosemary Rolls. Beautiful Kaiser rolls, and something that has been evading me for a long time. I'm anxious to try. One question: is the egg white part of the recipe, or used for a wash? The egg white is in the roll. if powdered yeasy then put all in bowl and add the water yeast mix on top of the flower so the yeast does not come in direct contact with salt. 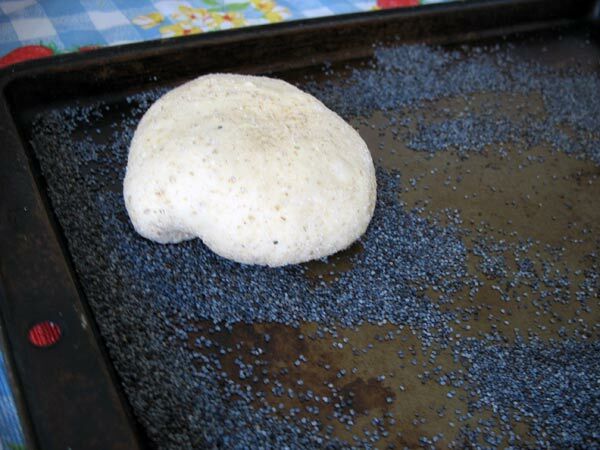 bake with steem in oven by spraing oven with water and placing a dry pan on the bottom ov oven wnet you put the rolls in the oven add water to the dry pan to get a large burst of steem in the oven and close the door fast. then spray the rolls 5 minutes and then 5 mintes after that and 5 minutes later remove the pan of water. 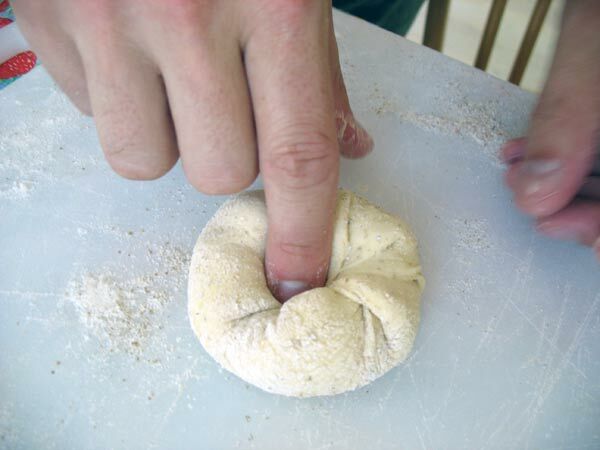 shapping them is involved but simply put your thumb on a round piece of dough and then fold the dough over your thumb 4 times creaseing the dough hard each time without moving your thumb take the last section and give in a twest and place it in the space that your thumb was in and press it in hard to prevent it from opening during the baking. Thank you for your reply, I look forward to hearing /learning much from you. It is not often we get theperspective of a veteran professional baker here on our humble bread board. What region of the country do you hail from? the rolls in the picture look good BUT they baked blind meaning that the folds baked connected and did not bloom like a kiser roll should. 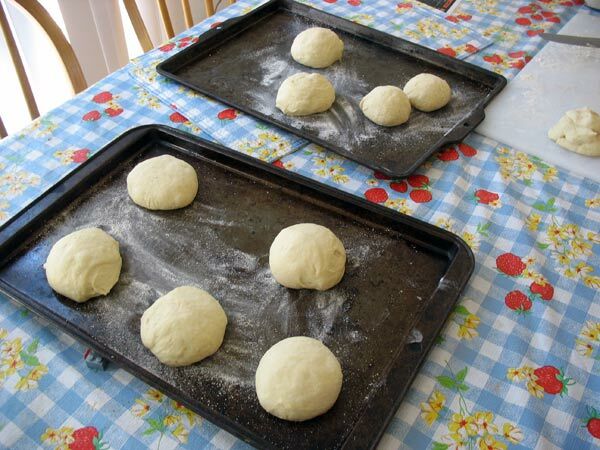 the same dough is uset for salt sticks and onion rolls for onion rolls just round and flatten in a mix of dry miniced onion soked in warm water and drained then add a little oil and seeds. for a real bakery taste use the dry onion as i have said (since that is what the bakeries use. Not Fresh chopped. "Place the dough in a greased bowl, cover, and allow to rise until doubled in size, approximately 1 hour. Allow it to rise a second time for an hour before shaping. " Sorry, but I am just confused about the second rest. After it has doubled in size, should I scale the pieces and then let rest an hour and then shape? or let double in size for an hour/ rest an extra hour? in the home allow the dough to rise once and punch back alow the dough to rest about 20-30 minutes depending on the temp. cut the dough into pieces between 1.5.and 3 oz wieght depending on the size you want dust the dough and the work bench with white (light) rye flour which will prevent the shape from baking toghter (Blind) flaten the dough piecen and place your thumb on the flatend piece and fold about 1/3 if the piece over your thumb and hit the dough with the side of your other hane to creat the fold with out removing your thumb then repeat folding the dough piece over your thumb again till you have doen this 4 times ...then take ouy your thumb and give the remaining section of dough a twest and tuck it in to the space left by your thumb and pressit in fermly so it will be lockrd in place and will not open when baking. also if you use a cutter to shape (stamp) the rolls you should proof the rolls right side up NOT UPSIDE DOWN xovered with plastic or other air tight cover to prevent the rolls from getting a skin prior to baking. which will prevent the rolls from springing in the oven. Thanks for your experience! I will be trying that expertise soon! thank you, I will now be able to try this recipe risk-free! sorry for my poor keyboard skils which result in tons of errors but i hope my 30+ years working in the baking bis makes up for some of that. ps please post some pics of finished product i havent had the time to post pics yet vut i will and if there is a way i will make a video of the bakery way to shap these rolls as well as the way i was taught to braid by a at the time an older jewish baker who i might add was a very tough teacher who used to hit me when i did not get it right. but that was ok taking for granted that i learnd the hard way starting as a pot washer and then being taught by a man that had a number tatooed on his arm. 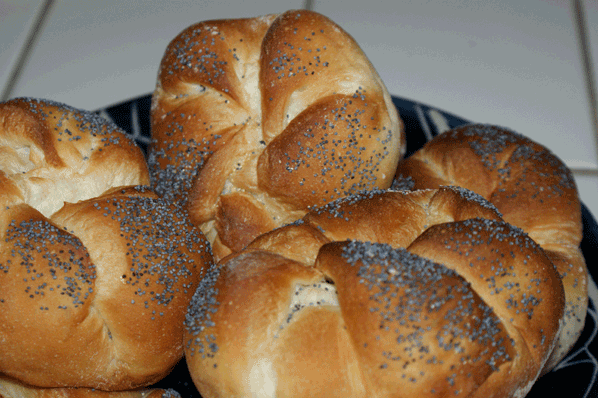 So many people are making lovely Semmel or Kaiser Rolls and I have been practicing folding and shaping. While my folding and shaping can use a bit more practice, my real concern is with the actual recipe. I can't tell from the beautiful photos whether the inside is what I taste in my mind when I recall Semmel from our days of living in Augsburg. ... light airy tender melt-in-the-mouth crumb with a thin crispy crust.. I have made two attempts from Daniel Leader's (Local Breads) Rosetta Rolls. He says they are an offshoot of the Kaiser rolls of Bavaria. He uses a large amount of Biga with just a little more flour and water added the next day with a bit of salt and diastatic malt. I followed the recipe exactly on my first batch, but ended up with little tight round dinner rolls with a tight crumb. He said to retard the dough several hours in the refrigerator...after shaping, but without proofing. Then he bakes without proofing. I thought that could have been an error in his book, so today I made another attempt and varied from his recipe, using the slap and fold kneading technique and raised them at room temperature according to instructions in another recipe. They were raising and spreading out so nicely, but in the oven they tightened up and became, once again little round dinner rolls with a chewy crumb and a crunchy curst. My husband says they are delicious, but they are NOT Semmel. I used steam in the oven both times, using ice cubes in a cast iron pan, the method endorsed by Leader. I am ready to try a different recipe as soon as I get my digital scale...which is ordered and coming soon. I have found a few recipes through web searches, some calling for oil or butter, milk and egg whites. The recipes here also call for eggs. Are they necessary to the light crumb? I intend to try a new recipe as soon as my digital scale arrives. I doubt my measurements can be off, but I guess anything is possible. My old scale is a spring one without the precision of a digital. If anyone can help, I would appreciate trying a new recipe. I am saving the two recipes in this thread as well as the one from King Arthur Flour. I also have found a few more on other recipe sites, but don't have reviews of them. Some call for stiffly beaten egg whites in the dough. My husband says I'm fixated, but I can't stop until I make *real* Semmeln. Any tips on which recipe has the fine light crumb and thin crispy crust? Any other tips for making them turn out right? I will really appreciate any help. I can't seem to move on to anything new until I master these Semmeln. Third, Norm's (nbicomputers) recipe found above in this topic makes super kaiser rolls. The best discussion of it is probably in the topics pertaining to Onion Rolls, which use the very same dough. Floyd's entry on onion rolls has links to a number of other topics. I'd suggest reading them and coming back with any remaining questions. This topic has a clear recipe and instructions for the onion rolls. Obviously, the shaping is different. Note that the proofing is also different. I suspect how you are proofing your rolls may be part of your problem. Norm made a video of shaping kaiser rolls, using the authentic technique. I'd suggest you view it also. I hope this all helps. Please update us on your progress and do ask any other questions you have. I have watched Norm's (nbicomputers) video several times and I've saved a little piece of dough to continue practicing his technique. I havn't quite mastered the slamming of my hand edge down on the dough without flattening out my former fold...LOL. Of course, before I found that, I bought a Kaiser roll stamp, too, so if my technique doesn't satisfy me, I can resort to that. I'll check out the other links, too. Unfortunately, my new scale is not here yet, so I have to wait for it before I try his recipe with the precise ounces. Secondly, I'm having eye surgery early Mon. morning, so I suppose I won't be doing any kneading or slapping of dough for several days, not to mention my ability to focus my eyes will be poor for a while. I had planned to master this before the surgery. I wonder if anyone has ever tried an egg substitute in a bread recipe. I was so hoping to show off my rolls to my daughter, but she has recently had to go off eggs and dairy until she weans her infant son who is highly allergic and the eggs and milk were getting to him through her milk. This will probably be another year before she can eat normally again. I've been researching egg substitutes, but not sure how well they work for yeast bread. I will keep a watch on this thread. Hopefully, I'll soon be trying another batch. I am on a similar journey, Catherine. 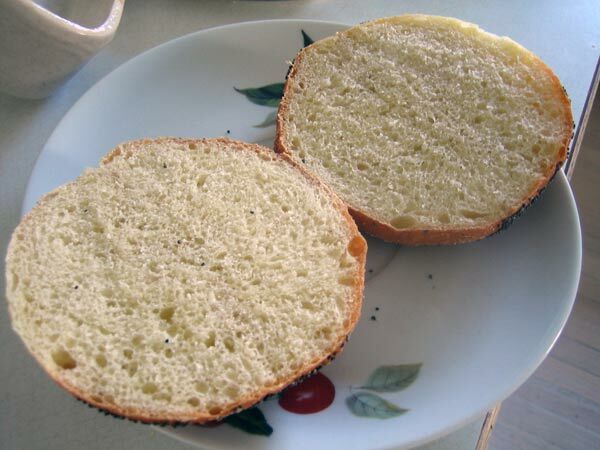 There was a Kaiser roll in my childhood memory that certainly looks like Norm's rolls but the inside was much different. Light and airy with a more open crumb. Like you, I am looking for the right recipe/technique to recreate these. Been thinking about a slow fermentation, making it go overnight. Dan, Yes, I remember a much lighter more open crumb, too. I am experimenting right now. I will make notes and take pictures as I go and will report once I find the right formula. It may be some days and several batches before I have much to report. Daniel Leader's formula used a biga as most of the dough. It fermented overnight in the fridge and had only a tiny bit more flour added the day of baking. I was not happy with it. They raised up round, but had a very tight crumb and chewy crust. I'll report back if I come up with something that works. I'll look for you to do that same. If you want to remove the egg white and milk then by all means do so. You can also use a baguette recipe. I like making a 100% hydration overnight poolish. The folds are easier with a lower % hydration but I encourage a softer dough for the more open crumb. You might want to add some fine spelt flour for softness, like 20% of the total flour weight but this can also make for a softer crust. I like the crust egg shell thin and just as crispy. Semmeln, like baguettes, don't keep very long and are best warm right from the oven. After cooling, don't bag in plastic but group in a net, basket or in thin paper. Mini, I like the idea of using a baguette recipe. I baked only 4 rolls from today's recipe and put the rest in the fridge to see how it will be with an overnight ferment. The rolls were lovely and tender, but the crust was tender, but it was not the egg shell thin crispy one you describe. That will be my next try. Do you have a specific recipe using the poolish as you describe? If not, I have Local Breads, The Breadbaker's Apprentice so I can choose one from either of those and try for that perfect crust.The crumb of today's rolls was not quite right either. It was very tasty and tender, but I believe the egg and oil gave it a different texture. In the next couple days, I will attempt the baguette formula. Thanks for the tips. 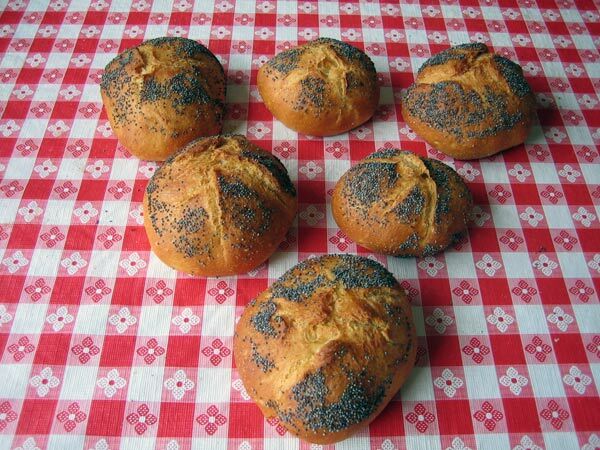 I have been trying so many different Kaiser and Semmel recipes with varying results. I won't post all the photos and gory details because I've lost track of which results belong to which recipe. MY FREEZER RUNNETH OVER with my attempts. I think some French toast is in order, maybe even some bread pudding. The recipes with egg, oil and sugar were too soft like a dinner roll. The more basic doughs produced heavy tight crumb with a gray color and chewy crust,not at all like the pictures and descriptions in the books. My DH says they tasted great, but I know they were way too heavy and most of them were varying shades of gray or gray streaked. I was really getting discouraged. Some were more gray than others. Some just had gray streaks. I was perplexed. To make matters worse, my web site was hacked and I couldn't bake for 3 days while I struggled to fix that. Now I am back to bread and have some good news. Finally, for a break, I made Peter Reinhart's Whole Wheat Cinnamon Buns from his Whole Grain Breads book. What a comfort to have something come out just right. I even made a second smaller batch using an egg substitute to accommodate allergies of family coming to visit. They, too, were perfect and you can't really tell I used an egg substitute. The pan on the right have no egg, but a concoction I made up to simulate egg in baked goods. Encouraged by that success, I turned my efforts back to Semmeln. I found a blog by one member who is doing the BBA Challenge and she had the most beautiful Kaiser rolls. She said she used the stretch and fold method of non-kneading. Based on her photos, I had to try it. I got wonderful results. I did not use the egg wash, though, because that would make the crust soft. The crumb was delightfully light. The flavor was out of this world. I was in Heaven! DH laughed as I made exclamations with each bite. Here are my successful Semmel, very high, very light. The only fault I could find was that the crust softened on cooling and was just the tiniest bit chewy. I emailed Peter Reinhart and he suggested I spritz them with plain water only (I was using a bit of corn syrup in the water) and to bake a little slower. So I made another batch today and made one more change to his recipe. I changed the one whole egg to 2 egg whites. I believe it did make the crumb even a bit softer and lighter. I'm not sure if it contributed to the lightness of the crust, but I think it might have. I am still not happy with my folding technique and am not really happy with the stamp, either. I am experimenting with how deeply to cut it. Either I cut right through and it looks as distorted as a badly folded roll or the lines disappear in the oven. I like Reinhart's knotting technique and the rolls are fairly uniform and tidy looking. Although the high dome is sort of impressive, the lower tops are nicer for sandwiches. For breakfast, I break off pieces and slather them with butter...mmmm. I made two batches today so I could experiment once again with the eggless recipe. My egg substitute seems to work well. if anyone is interested. just ask and I'll share my formula for that. The rolls are huge; wish I had put something in the photo for perspective. The eggless ones came out just as beautifully. The rack on the left have no egg, but the substitute I concocted. I cut one to compare the crumb (left has no egg; right has egg whites in recipe). They were almost as light and airy as the ones with the 2 egg whites. I am happy that I can share the fruits of my labor with my daughter who loves all things home made. We had the most delicious BLT sandwiches for lunch and I was in heaven. I should have cut the sandwich to show the thickness of the roll and the 3/4" thick tomato, but I thought it would hold together better while eating if it wasn't cut. Now I think my problem with the other rolls and breads might have been the kneading. Leader requires his doughs to endure long vigorous kneading cycles in the machine. I wonder if that was what turned my crumb to a chewiness that bordered on rubber. I think I will be a big fan of the fold and rest method now. I'd like to try Leader's recipes using that technique and see if I have some success, but Reinhart's formula is so nice that it will be hard to try another. I have a pre-ferment ready to make the BBA French Bread tomorrow to see if my success follows across recipes. I am hopeful. learning curve... worst kaiser rolls ever! Ouch, and I thought I'd make a good impression on my husband. Wish I had made my rolls during the week where I could hide them or feed them to birds! started with a medium vienna dough, let it ferment for 2 hours, shaped the rolls and brought them to full proof, then baked at 450 with lots of steam. Formula's gonna be in the book. And I like the new look to your baker supply site as well! Lookin' real good! I remember 50+ years ago in Brooklyn going with grandpa to Molly Fitzpatrick's (yeah Irish) to get the Kaiser rolls. I have been trying to duplicate them for years but to no avail. The rolls which I believe to be authentic look much like the ones in the photos above but not when they are cut open. My rolls were cut sideways and each side would get a generous amount of cool creamy butter. Then I would fold the roll and watch as thousands of crumbs would fall to the dish to be picked on later. Then it would get dunked in the coffee. The inside was doughy, unlike the dry looking one in the photo. 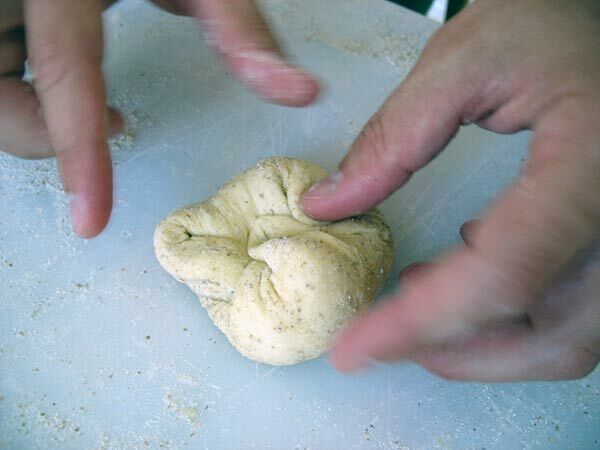 You could pull clumps of dough from the roll before buttering. I made the best ones ever yesterday but still did not hit the mark. 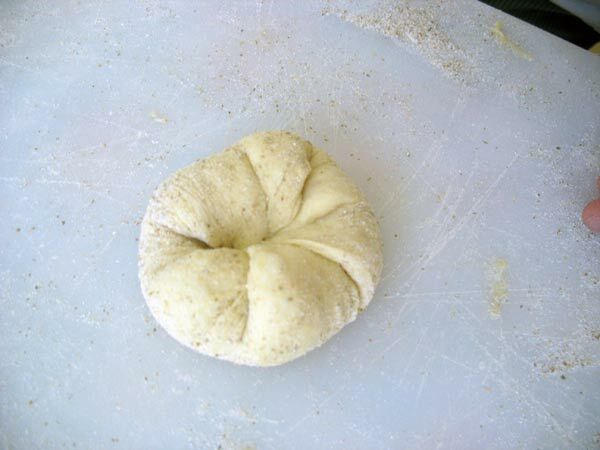 Does anyone know how to make my perfect Kaiser roll? Thanks. Pastor Jack, one more trick with your roll. If you up the malt (diastatic) in the recipe just a half teaspoon, you will get a more doughy middle like you remember, just make sure it is baked through. I would stick to the recipe and keep the yeast and sugar the same. Most of that middle is formed by the knife as it cuts into the roll. If the roll is cut straight across, it looks dry, cut it open by rotating the roll cutting half way into the roll. Try it and be delighted! Interesting to see the various ways Kaiser Rolls are shaped. also makes a nice looking roll. Made the Kaiser Roll recipe with excellent results. Formed the rolls per the recipe directions, and also by knotting a thin log, with equally good results. Dusted the counter with rice flour, and assume that semolina would be equally effective as they tend not to combine with the dough. Because of dietary restrictions salt was not used, and no problems resulted. I highly recommend this recipe. Made the kaiser rolls today and sadly they came out like hockey pucks.